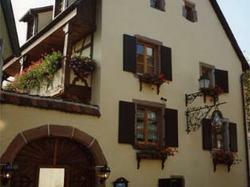 This 16th-century Alsatian house is situated near the Alsace Wine Route. The rooms and self-catering apartments feature traditional wooden furniture hand-crafted by the owner, and free, private parking for cars and motorbikes is available on site. All of the accommodations at Le Gambrinus include a seating area and a flat-screen TV and free Wi-Fi access. A private bathroom with shower is also provided. You can choose from self-catering apartments or studios. A continental breakfast is included for all accommodation types. The on-site restaurant serves traditional cuisine cooked in the wood-fired oven. You can also sample local wines and beers in Le Gambrinus's bar. Antiquités d'Alsace offers restored and hand-crafted wooden Alsatian items for sale. The scenic village of Riquewihr is 2 km from Le Gambrinus and Ammerschwihr Golf Course is 9 km away. Please note that the restaurant is only opened in the evenings. It is closed on Mondays. Please note that after 17:00, check-in takes place in the restaurant. In case of arrival on Mondays, please contact the property in advance. Located 20 metres from the main building, this spacious apartment has 2 bathrooms, a private terrace and a fully equipped kitchen. Four TVs are also provided. Bed linen and towels are included in the price of the apartment. Guests who stay in this apartment can use the private garage to park their vehicle. This self-catering apartment has a flat-screen TV. Bed linen and towels are included in the price of the apartment. This self-catering studio has a flat-screen TV. Bed linen and towels are included in the price of the studio. Hand-painted wooden furniture are provided in this en suite room.